The book opens with Karate Kid reminiscing about his past relationship with Shadow Lass, which resulted in them breaking up because he was overanalyzing everything. It cuts back to the present and Shadow Lass is asking Karate Kid for advice about her current relationship with Ultra Boy. Ultra Boy was the strongest member of the Legion before Supergirl arrived, and as such has been rather obsessed with her, trying to guess her power limits, etc. Karate Kid says to leave it to him and he'll handle the situation. We cut to a Legion rally in support of Brainiac 5 for the new leader where one of the people in the crowd gets fed up with the Science Police, who are trying to break up the rally, and attacks them. Cosmic Boy and Supergirl show up and stop him, telling him that's not the way the Legion does things. Cosmic Boy tell the attacker that the Legion has needed a new official "energy-caster" since Sun Boy resigned, and says they'd like to train him and have him join the team. Supergirl gives Cosmic Boy a kiss on the cheek and flies off with the attacker, taking him to Legion HQ to get trained. Invisible Kid then shows up and tells Cosmic Boy that, despite what he thinks, he's not in love with Supergirl. They go back to Legion HQ where Invisible Kid shows him scans he's run on both Cosmic Boy and Supergirl. Apparently something about Kara's electromagnetic field interferes with something in Cosmic Boy's own E-M field (possibly due to residual effects of Kara's traveling through time) and that's what's causing the funny feelings Cosmic Boy gets every time Supergirl's around. Cosmic Boy seems relieved and leaves, which pleases Invisible Kid as he says to himself that he doesn't need the competition, right before walking into a room that he has apparently dedicated to Supergirl. Karate Kid and Ultra Boy are now in the snowy cold of Australia (the planet shifted, remember? Ski the slopes in Sydney!) where Karate Kid is trying to help Ultra Boy with his training and being able to better focus to control his powers. After showing Ultra Boy the benefit of never letting his guard down, Karate Kid says they need to have a talk about Supergirl. We then go to a planet called Narchus III, where the aforementioned Sun Boy and a group of other people are looking for 50,000 missing dominion colonists. They look around the city, which is devoid of even any bodies, when they're suddenly attacked by a toothy, brawny, Super-Dominator who makes very short work of the entire group. Back in Metropolis, Shadow Lass arrives to confront Supergirl about Ultra Boy, but before she can get into the discussion Karate Kid shows up and says she's needed urgently on the desert moon of Tykon, which is about to be destroyed by a meteor swarm. 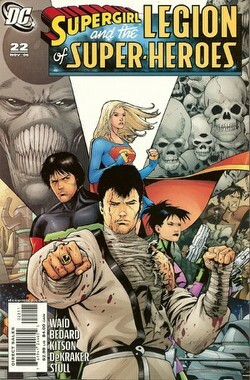 Kara flies through a portal and Shadow Lass fumes, thinking Karate Kid has set Ultra Boy and Supergirl up on a date as Ultra Boy was the only other Legion member sent on the mission. As Supergirl and Ultra Boy bat the meteors away from Tykon, several hours pass and Supergirl appears to grow very weak from the orange (and not yellow) suns in the area. Ultra Boy, confidence renewed, throws her back through the portal to Metropolis and handles the rest of the meteors on his own. Supergirl pops out the other side of the portal and Karate Kid catches her. Kara asks him if it worked, and Karate Kid replies that it should have. All they needed was to let Ultra Boy come out on top over Supergirl to restore his confidence and end his obsession with Kara, and Shadow Lass seems pleased at the results. Sun Boy and his group wake up on an unfamiliar ship floating out in space, on which there is some sort of countdown in progress. Story - 3: This book just felt like a jumble. I've only been reviewing since Supergirl joined the team with Issue 16, and not once in that time do I remember seeing or hearing mention of Sun Boy. So after no less than six issues suddenly the leader of the Legion mentions they've had a deficiency without him? And who are all the people Sun Boy is with, and what the heck are they doing? It seemed very random and tacked on, especially when there are so many concurrent storylines running that didn't get a single mention here. Colossal Boy and the angry giants from Big City? Nothing. Brainiac 5 trying to resurrect Dream Girl, whose body then disappeared? Nothing. Frankly I don't see what good introducing Sun Boy and his little group of unknown characters is going to do at this point when other stories would have been better served by getting a few pages of face time. Of course it is possible that this Sun Boy sub-story started before I began reviewing the book, I freely admit, in which case it's not adding another new sub-story so you couldn't count that as a strike. But even if that is the case, then this sub-story hasn't been worth a single mention in six issues and why would you wait that long between parts of a story? Either way you look at it, it's a problem. Tony Bedard was assisting on the writing again. I still don't know what he's doing, but ever since he's come on board the book hasn't been as good as it was when Waid was the only writer. I long for those issues. Art - 3: Again, not wholly Kiston. Waid & Kitson, Waid & Kitson... yeah, that was good stuff! Now we get Watered Down Waid and Watered Down Kitson and, no sir, I don't so much care for it. DeKracker's pencils on Kitson's layouts just doesn't do anything for me, and lacks the spunky personality that Kitson's art possesses. Can we just drop the added assistants and get back to the originals, please? Cover Art - 3: Why is Shrinking Violet on this cover? And why is she holding two guns, when the number of Shrinking Violets in this issue is -1, and the number of Shrinking Violet guns is -2? And what's with all the alien skulls in the upper right? And, for that matter, the action scene below that, which has absolutely nothing to do with this issue? Half this cover has nothing to do with this book. The other half is mildly related to the actual content of the book. But hey, at least it's actual Kitson art for a change, so I guess that's something.